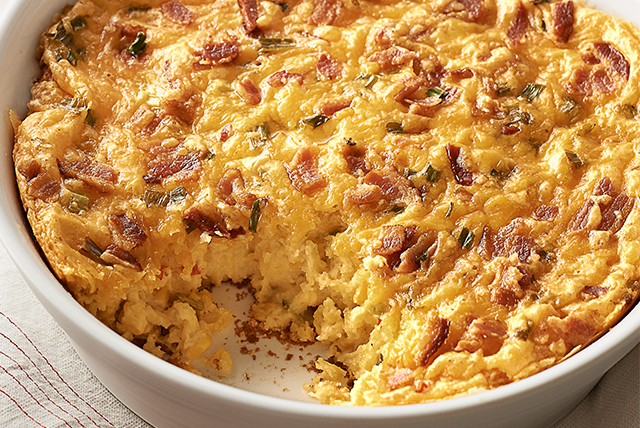 This bacon-Cheddar side dish brings new life to corn pudding. Not your average vegetable side, this baked corn pudding will be the new family fave. Mix flour, cornmeal, baking powder, baking soda and salt in large bowl until blended. Add corns, eggs and 1/2 cup cheese; mix well. Pour into 2-L casserole dish sprayed with cooking spray. Bake 35 min. Meanwhile, combine remaining cheese, dressing, onions and bacon. Top casserole with cheese mixture; bake 10 min. or until lightly browned. Mix pudding ingredients as directed; pour into 13x9-inch pan sprayed with cooking spray. Bake in 375ºF oven 20 min. Top with cheese mixture; bake 15 min. or until lightly browned. Stir 1/4 tsp. cayenne pepper into pudding ingredients before pouring into prepared casserole dish and baking as directed. For a meatless version, omit the bacon bits.